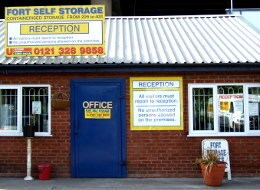 If you're looking for clean, secure and cheap self storage in Birmingham, then Fort Storage is your answer. We offer great storage container space for household and business customers on our massive 3.8 acre site opposite the Fort shopping park. We are conveniently located in the West Midlands with superb links to all major roads including the Spaghetti junction. We offer complete flexibility on your self storage solutions and access needs – U self store, U lock, U keep the keys. The choice is all yours and there is no minimum time. We also offer open yard storage for cars, boats and plant and machinery. Our site is fully secured.. We provide 24 hour onsite security night patrol with CCTV surveillance. Store for weeks, months or even years. Start storing with only 1 day notice. Have free access 24/7 days a week. Self storage solutions with no minimum time period. Get your deliveries received by us on your behalf.